This USB to parallel converter consists of a USB A male on one end and one C36 male on the other end. It allows you to connect a parallel printer through the USB port on your computer. It is bi-directional and is USB 1.1 compliant with a maximum transfer rate of 12 Mbps. The USB 2.0 serial adapter allows serial devices to easily interface with USB computers. 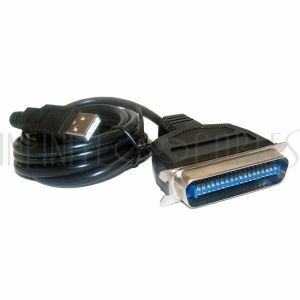 The adapter is designed for connections to PDA's, Digital cameras, modems or ISDN terminal adapters through your USB port.